Much like Paladins Monks can heal, damage, and tank and their resources are similar. Monks use Chi as their main resource, but also Energy, and Chi operates much like the Paladin’s Holy Power. You build it up with certain abilities and then use it to power other abilities. Monk abilities that don’t use Chi, such as their basic strike Jab, will use Energy or Mana. Everything that you do will be based around building and expending these resources. This page is an overview of Monks in general. For more detail in specific areas you’ll want to hit one of the linked pages. Monk Leveling – our leveling guide for Monks covers abilities, gearing, talents, glyphs, and more. everything you need to understand the class and charge ahead is here. Windwalkers for the Damage – This is the “damage” (DPS) specialization (spec) for Monks. Windwalkers can effectively handle small groups of enemies with their heals and area effect attacks. They can also be effective in PvP. Here’s a Windwalker Monk PvP gearing guide to get you started. Mistweavers for the Heals – Mixing together brews, mana, and chi the Monk is an effective healer. Brewmaster tankage – Brewmasters round up the group and, with a little help from the friends, burn them down. Brewmasters’ abilities are geared around survial and keeping the attention of all of the opposition (gaining threat through area damage.) Brewmasters are also interesting in PvP. Not so much damage, but slows and mitigation make it a challenge and make you hard to take down. Multistrike gives you two chances (one in PvP) at an extra strike at 30% effect. If it fires note that its effect is based off a new roll, and not that mighty empowered critical strike of doom you just pulled off. Of course, its own roll might be a crit. Versatility adds to your damage and your heals. So 5% Vers. adds 5% to both. It adds half its value to your damage reduction. So the more damage your taking the better the stat is. Various tertiary stats and gems slots have a random chance to appear on dropped or created gear (such as from gear tokens earned in your Garrison.) None will appear on vendored gear. These stats are Speed (move faster,) indestructible (item takes no damage,) Avoidance (like Dodge,) Leech (gain health,) and the gem slots. See the links above to get to pages with far more detail on stats, rotations, talents, etc. All Monks will wear leather armor and all monks will get a bonus at level 50 which adds +5% to your main stat if you are wearing all leather armor. Brewmaster: Agility, attuned stat is Crit. Windwalker: Agility, attuned stat is Multistrike. Mistweaver: Int, attuned stat is Multistrike. There are no PvP stats in Warlords. Well, not on level 100 gear, though you can still get both resilience and PvP Power on level 90 and lower PvP gear. Resilience adds to your defense by reducing incoming player damage. The Res on your gear will be good enough, so any gems or enchants you add should be for stats. PvP adds damage/dealing towards players. As with Res. and gems or enchants should be towards stats. For Monk PvP it’ll be worth your while to visit Skill-Capped. These are the abilities that all Monks will learn as they level. See below for the abilities learned by the Winwalker. All abilities are learned automatically as you level. 1 Jab – Your basic attack. Use this to generate the Chi for your bigger attacks. Costs Energy to use. 1 Stance of the Fierce Tiger – Your basic stance. Increases Chi generation and movement speed. 1 Way of the Monk (Passive) – Get more auto-attack damage when dual wielding one-handers or more attack speed when using a 2-handed weapon. 3 Tiger Palm – Uses Chi, does some damage, weakens opponent armor. 5 Roll – Quickly roll a short distance. A bit like a mage’s “blink.” Two uses every 20 seconds. Your first tier talents modify this ability. 7 Blackout Kick – Uses Chi, also enables a small amount of healing to your team. 10 Tiger Strikes – Chance for increased attack speed and extra strikes. 12 Surging Mist – Heals the target. 14 Provoke – “Yo momma is so fat…” This is a taunt and the mob will run towards you. 18 Resuscitate – restore a friendly target to life. 20 Detox – Remove poison and disease. 20 Zen Pilgrimage – Teleports you to the Peak of Serenity, leaving a marker behind. Cast it again to return to the graveyard nearest your marker. 22 Touch of Death – Insta kill a non-player enemy with health <= yours. Requires 3 chi. 24 Fortifying Brew – Increases health and reduces damage for 20 seconds. 30 Nimble Brew – Removes various incapacitating effects and makes you immune to them for 6 seconds. 32 Spear Hand Strike – interrupt spell casting, also silences casting if used in front of the opponent. 44 Paralysis – Put your target to sleep for a while. Costs energy. 46 Spinning Crane Kick – Damages all nearby targets, costs energy, generates 1 Chi if it hits 3+ targets. 54 Crackling Jade Lightning – Cast lightning at the enemy causing damage over 6 seconds. Might generate a Chi point. Enemies affected by the lightning will be knocked back if they attack within melee range. 87 Transcendence: Split your body and spirit, leaving your spirit behind. Such as at the top of that cliff. 87 Transcendence: Transfer: Swap positions with your spirit, to get back to the top of that cliff, for example. These are the abilities that define you as one or the other flavor (spec) of Monk. Note that many of these are passive (P) effects. 1 Critical Strikes (P) – Base 10% chance to crit. 10 Mana Meditation (P) – some mana regens while in combat. 1 Critical Strikes (P) – Base 10% chance to crit. 10 Bladed Armor (P) – Your Bonus Armor also increases your Attack Power. 10 Crane Style Techniques (P) – improves several abilities. 10 Dual Wield (P)– Weapons in each hand. 10 Dizzying Haze – Area effect brew splash causes threat and slows enemies. Spammable. 10 Stance of the Wise Serpent – more healing. 10 Fists of Fury stuns and pummels targets in front of your for 4 seconds. 10 Resolve (P) – Your Healing and Absorption increase based on damage taken. 10 Soothing Mist – heals the target over 8 seconds. 18 Flying Serpent Kick – Fly for 2 sec, the landing damages enemies. 10 Dual Wield (P) – Weapons in each hand. 10 Stance of the Spirited Crane – heal allies while attacking. 20 Combat Conditioning (P) for better kicking. 10 Stance of the Sturdy Ox – More defense. 16 Enveloping Mist – heals the target over 6 sec. 22 Touch of Karma – damage is reflected to the enemy. 11 Keg Smash – damages and slows nearby enemies. 20 Internal Medicine (P) – your Detox spell also clears magical effects. 26 Afterlife (P) – occasionally gain healing or Chi spheres. 18 Breath of Fire – Your spicey breath damages targets in front of you. 22 Legacy of the Emperor – Increase Str/Ag/Int for the entire raid. 36 Energizing Brew regenerates 60 energy over 6 sec. 26 Guard improves your absorbs and heals for 30 sec. 24 Renewing Mist heals over 18 seconds and bounces to allies. 50 Leather Specialization (P) – More agility if all your armor is leather. 36 Elusive Brew – Use your brew to better dodge attacks. 50 Leather Specialization (P) – More Int if all your armor is leather. 56 Rising Sun Kick your kick causes nearby enemies to take more damage and your main target to receive less healing. 45 Desperate Measures (P) – Expel Harm has no cooldown at low health levels. 50 Life Cocoon – cast an absorption shield on your target. 56 Tigereye Brew – consume to increase damage and healing done for 15 sec. 50 Leather Specialization (P) – More agility if all your armor is leather. 56 Brewing: Mana Tea (P) 75 Storm, Earth, and Fire summons an elemental spirit to help you out. 56 Gift of the Ox (P) – summon the occasional healing sphere. 56 Mana Tea restores Mana. 80 Mastery: Bottled Fury (P) – more charges of Tigereye brew. 70 Summon Black Ox Statue – drop a statue which threatens all enemies within 30 yards. 80 Windflurry grants the raid 5% Multistrike. 75 Purifying Brew – purifies away your staggered damage. 62 Uplift heals all targets already affected by your Renewing Mist. 81 Legacy of the White Tiger – Increase Str/Ag/Int and Crit for the whole raid. 80 Mastery: Elusive Brawler (P) – More Stagger and Attack Power. 64 Detonate Chi causes your healing spheres to pop off, healing any nearby ally. 82 Zen Meditation – 90% reduction to all damage for 8 seconds. 81 Legacy of the White Tiger – Increase Str/Ag/Int and Crit for the whole raid. 66 Thunder Focus Tea improves your next Surging or Renewing Mist. 90 Battle Trance – 15% more Multistrike. 82 Zen Meditation – 90% reduction to all damage for 8 seconds. 70 Summon Jade Serpent Statue improves certain abilities depending on your stance. 90 Ferment (P) – 5% more Crit. 78 Revival heals all party members (within 40 years) and removes effects. 80 Mastery: Gift of the Serpent (P) – healing spheres are randomly summoned. 90 Jade Mists – more Multistrike. Perks are enhancements to existing abilities. You will get four of them, one at levels 92, 94, 96, and 98, but the order that you acquire them is random. At 98 you will have all four. All of the perks are passive. Enhanced Roll – your rolls are faster. Enhanced Transcendence is faster Transcendence. Improved Breath of Fire – B of F is now an 8 second effect. Improved Guard – Guard now has 2 charges. Improved Life Cocoon – faster cooldown. Improved Renewing Mist – lasts 2 seconds longer. Empowered Chi – +1 max Chi. Empowered Spinning Crane Kick – same damage in half the time. In Warlords: Racials with Hit & Expertise are dead. Most races can be a Monk. Yes, even Gnomes, but no Goblins or Worgen. Can choose to join either the Horde or the Alliance upon earning the right to leave their starting area. You don’t have to join, you can play as a “neutral” for awhile, if you want to experiment. Melee range stun has definite uses, even for Mistweavers, as it allows an escape from melee. Inner Peace: Rested XP lasts longer for faster leveling. Epicurean provides increased benefits from food buffs, which is generally a very nice ability. Being “Bouncy” means you take less falling damage; it is just the thing if you’re into cliff jumping. Their Gourmand ability provides a +15 cooking bonus. Arcane Torrent is a nice spell interrupt with some PvP utility (silence only in PvP.) Pretty nice for Brews and Winds, and those Misty dudes who like to get up close when healing. Well ok, Blood Elves look good. A truly devastating ability. Really. Acuity adds +1% to your Crit rating, which is a good stat for all Monks. Blood Fury increases melee and spell damage, which is perfect for Monks. The slightly increased pet damage (command) isn’t interesting to Monks at all, being petless. Hardiness allows a 20% decreased stun duration, which is pretty nice for PvP. War Stomp: Stuns up to 5 enemies within 8 yds for 2 sec. And a stomp is sort of a kick. Really. Endurance: Increases your Stamina by 197 (scales with level). Troll – Taste me Voodoo, Mon! Increased Haste when Berserk is very nice, esp. for Mistwalkers. More XP from beast slaying is very nice for leveling, but of no value otherwise. Shuffle reduces snare (slow) duration by 20%. 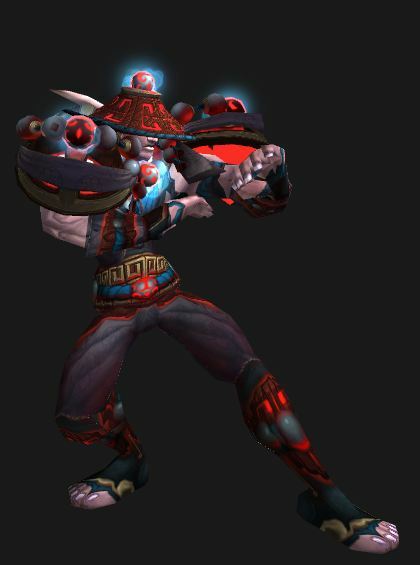 Underwater Breathing was gone (in Mists of Pandaria) and was replaced with a rather nice Drain Life ability, which will actually add a bit to your DPS numbers. This ability returned with Warlords and is now of indefinite duration. Useful when leveling and pretty nice for exploration, with occasional other uses. Cannibalize is useful when you just have to rub it in to that other player you killed. Maybe that’s good enough reason to go Undead. Minor Resistance (here) to Shadow damage. A small heal (Gift of the Naru) is always handy for a class that has no heals. Also usable on others. Your Heroic Presence now Increases your Agility and Intellect. Escape artist is very nice for PvP, as is their small size, and they get an increased mana pool. More – +5% more mana, which is noce for the Mistwalker crowd. Nimble – +1% more Haste, which is a decent stat. Shadowmeld requires you to stay still. It drops aggro and can be used in combat. If you time ‘meld just so you can break incoming spells. 5.3 Patch Notes for Monks: Here are the patch 5.4 Monk changes. Or go here for all the official 5.4 patch notes. 5.2 Patch Notes for Monks: The official 5.2 patch notes, for everything, are here. Once upon a time, while leveling, you had to look up quest details on some website. There was no in-game help and you had to trundle along as best you could. That was when there were only 60 levels. Now we have the new(ish) Monk class, 100 levels, thousands of quests, and a bazillion mobs to kill. Whether or not you’re playing a Monk that’s a daunting task. Here’s how to make it easy: Now you have a guide which sits in-game, in a small window, and shows you step-by-step where to go, what to do, and everything you need to know to make leveling easier. 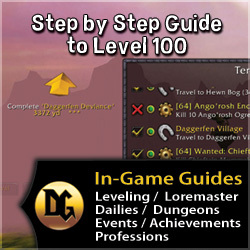 Dugi’s Guide shows you the best and fastest path to complete those quests and get yourself to the top levels ASAP. Want to get a level, or several levels, in the dungeons or in PvP? No problem. Dugi’s will remember where you left off and then it will figure out where you should be at your new level and pick up from there. Brand new to WoW? Decked head to toe in Heirlooms? Mixing up questing with PvP and/or dungeons? No problem, Dugi has your back all the way from level 1 to the level cap, or whichever level you start from. Dugi’s in-game guide is always quickly updated for all patches and expansions, so it’s never obsolete. Grab yours here and get leveled fast. Who knows, you might be be able to match their Leveled 1 – 100 in 3 days, 2 hours /played time. Actually, this page IS due for some more generic Monk info, including basic stats and such.